Hirschmann RED25 switches enable cost-effective, customizable networking solutions for industries in need of redundancy and security. 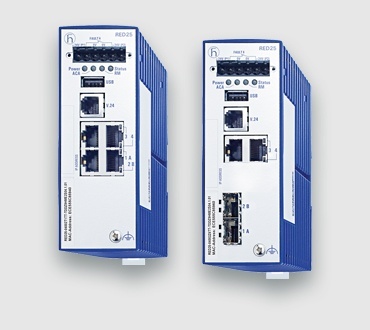 This family of entry-level, Fast Ethernet redundancy switches is designed for use in industrial automation applications that need high-end redundancy topologies. To offer flexibility for network administrators, the switches are available in two versions: four Fast Ethernet (FE) TX ports or two FE TX ports, plus two FE small form-factor pluggable (SFP) ports. RED25 is based on Hirschmann Operating System (HiOS) software and offers a comprehensive range of security features. Entry-level product with many features and port configurations. Creates one of the best cost-performance ratios on the market. Maximum productivity for systems and machines based on interruption-free data communications. Supports many redundancy technologies, including parallel redundancy protocol (PRP), high-availability seamless redundancy (HSR), device level ring (DLR), rapid spanning tree protocol (RSTP) and media redundancy protocol (MRP). SFP modules enable simple, in-the-field changes. Learn what Parallel Redundancy Protocol (PRP) is and how it enables loss-free switching.